Insert Garden Party write-up as follows. “Our annual Garden party held on one of the hottest days of the summer, July 16th, and was a great success. It was held in a Thuso supporter’s large garden. There were traditional South African foods available and plenty of cold wine and beer. Children also enjoyed the day. There were also some excellent raffle prizes won and home grown plants for sale. The party was also a great financial success, and means that we will be able to contribute to the school feeding fund again”. In May 2006, members of Action for Southern Africa Waltham Forest (ACTSAWF) set up a charity to support an increasing number of orphans and destitute young people who need food at Thuto Lesedi High School in South Africa. 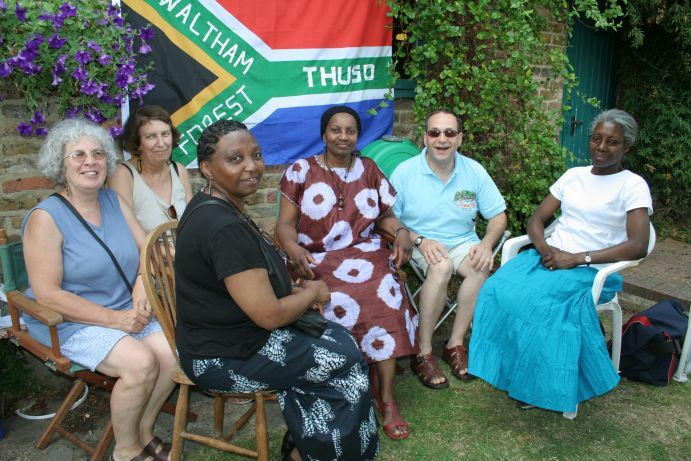 The view is that charity status of Waltham Forest Thuso for South Africa (WFTSA) will allow access to a variety of fundraising initiatives and funding sources. Four years ago ACTSAWF responding to the challenge, started paying school fees and buying books for young people at Thuto Lesedi Secondary School. Initially only two pupils were sponsored. In 2005 the number sponsored had risen to fifteen. Discussions with the Head Teacher and the Pastoral Teacher reflect a high and increasing number of orphans at the school. In 2005 a profile of the school showed that 30% were orphans, 5% of these heading families where there were no adults. During a visit to South Africa that year I observed a harrowing level of poverty and deprevation among the young people ACTSAWF supported (writes Mmapula Tladi – Small, Chairperson of ACTSAWF). Some of the young people went without food. Thabang Ndebele was an example. He said that he and his sister often drank water to quell hunger. His sister, also a pupil at the school, was head of the family. They relied on the generosity of neighbours for food. At times they were embarassed to beg and went to bed hungry. In January 2006 ACTSAWF sent £1000 to the school to start providing some food for the sponsored young people. In April, communication from the school stated that lunch had been extended to include the most destitute children. 120 were getting some food. For most, this is the only meal of the day. The size of need prompted ACTSAWF to set up the charity Waltham Forest Thuso in South Africa. “Thuso” meaning helping hand in Sesotho, one of South Africa’s 11 official languages. The challenge is to raise funds in order to provide food for more young people in need. Waltham Forest Thuso in South Africa and Thuto Lesedi High School are exploring ways in which food could be provided over the weekend and during school holidays. The aim is to include siblings who share a home. The head teacher is consulting local shopkeepers to assess the cost and feasibility of getting some support. During a visit to South Africa at the end of the year, Mmapala will join the head teacher in searching for examples of good practice in initiatives that provide food for young people and children in need within South Africa. Available information suggests that £10 per month could provide basic groceries for two or three young people in a family. Sponsored young people continue to make academic progress against all odds. Of the fifteen whose school fees were paid, and essential books bought, only one failed the end of year examination. The school reports that sadly her mother died during the examination week. She had been embarrassed to let the teachers know that caring for her mother was the reason for poor performance in the months leading to the examination.